The account that you entered when you first installed Mac OS X: If you entered the information for an email account, it’s available. Your .Mac account: If you registered for a .Mac service account, it will be included. 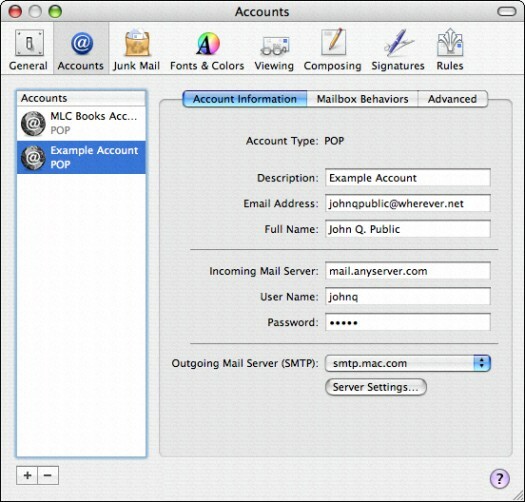 Upgraded accounts: If you upgraded an existing Mac OS system, your existing Mail accounts will be added to the Accounts list in Mail. Speaking of the Accounts list, choose Mail –> Preferences and click the Accounts button to display the Accounts dialog box that you see in Figure 1. From here, you can add an account, edit an existing account, or remove an account from Mail. Although most folks still have only one email account, you can use a passel of them. For example, you might use one account for your personal email and one account for your business communications. To switch accounts, just click the account that you want to use from this list to make it the active account. Figure 1: The Accounts list, where all is made clear (about your email accounts). To add a new account within Mail, click the Add Account button, which carries a plus sign, to open an Account wizard that leads you through the process. You can select an Apple .Mac account, a Post Office Protocol (POP) account, a Microsoft Exchange account, or an Internet Message Access Protocol (IMAP) account. If you’re adding an account from an Internet service provider (ISP), refer to the set-up information that you received to determine which is right. Most ISP accounts are POP accounts. For example, Work or Mom’s ISP are good choices. Messages that you send appear with this name in the From field in the recipient’s email application. You’re done! The new account appears in the Accounts list.